The 2012 NBA trade deadline has come and gone with mixed results for the teams involved. Milwaukee Bucks trade Andrew Bogut and Stephen Jackson to Golden State Warriors for Monta Ellis, Ekpe Udoh and Kwame Brown. Toronto Raptors trade Leandro Barbosa to Indiana Pacers for second-round draft pick. New Jersey Nets trade Mehmet Okur, Shawne Williams and a 2012 top-three protected first-round pick to Portland Trail Blazers for Gerald Wallace. Cleveland Cavaliers trade Ramon Sessions and Christian Eyenga to Los Angeles Lakers for Luke Walton, Jason Kapono and 2012 first-round pick. Portland Trail Blazers trade Marcus Camby to Houston Rockets for Hasheem Thabeet, Jonny Flynn and 2012 second-round pick. Los Angeles Lakers trade Derek Fisher and 2012 first-round pick to Houston Rockets for Jordan Hill. Washington Wizards, Denver Nuggets and Los Angeles Clippers make three-team trade. Washington receives Nene, Brian Cook and future second-round draft pick, Denver receives JaVale McGee and Ronny Turiaf, and Los Angeles receives Nick Young. 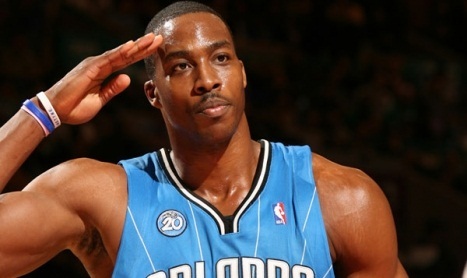 Dwight Howard decides to remain under contract with the Orlando Magic for the 2012-13 season. Who are the winners and losers of this year’s deadline? The Nets had hoped Thursday would be a watershed moment in franchise history with the announcement that Dwight Howard would be moving with them to Brooklyn. Well, at least Gerald Wallace is coming. The Nets struck out with Howard, who decided to stay in Orlando for at least one more season, and that could put them in a dangerous position with Deron Williams. If Williams doesn’t think the Nets are capable of surrounding him with enough talent, he could leave this summer and sign with the Dallas Mavericks or another team. The Nets also gave up a first-round pick – it’s protected only through the first three selections – for Wallace. He can help, but he’s not the star the franchise had spent all season chasing. After a week in which it appeared all but certain the Magic would have to trade Howard to avoid losing him for nothing, the franchise received a nice surprise when its All-Star center decided to waive his contract option and postpone his free agency until after the 2012-13 season. The Magic can focus on trying to contend in the Eastern Conference the rest of this season, and that’s certainly better than the alternative. But the pause in Howard’s soap opera might only be a commercial break. He professed his “loyalty” to the Magic by opting in for another season, but he didn’t commit to signing a contract extension. A year from now, the Magic could end up in the “loser” category. So much for celebrating the Blazers’ strong start to the season and LaMarcus Aldridge’s first All-Star selection. Portland instead used the trade deadline to overhaul the franchise. Longtime coach Nate McMillan was fired, Greg Oden was waived and center Marcus Camby was sent to the Rockets for a pair of draft busts (Jonny Flynn and Hasheem Thabeet) and a second-round pick in what essentially was a salary dump. Wallace also was sent to the Nets for center Mehmet Okur, journeyman forward Shawne Williams and a first-round pick. The Blazers’ implosion was both sudden and surprising. The team had tuned out McMillan and regularly has been getting blown out on the road. Even worse: The Blazers couldn’t move guard Raymond Felton and Jamal Crawford. The draft pick Portland received in the Wallace trade might be the only thing appealing to Blazers fans. The Clippers have been looking for back-court help ever since Chauncey Billups was lost for the season and free agent J.R. Smith spurned them to join the New York Knicks. This much is true: Nick Young can shoot. The Clippers didn’t have to give up much for the Los Angeles native – reserve forward Brian Cook and a second-round pick – and there’s a reason for that: Young, who is averaging 16.6 points on 37.1 3-point percent shooting, has shown his immaturity more than a few times on the court. The hope is that Young will grow under Chris Paul’s tutelage. If nothing else, Young showed how much he wanted to join the Clippers by surrendering his “Larry Bird” rights to ensure the deal could be made. Nene’s injury problems had worn on the Nuggets in the past and continued to do so this season when he was limited to 28 games. Denver has great confidence in rookie forward Kenneth Faried, but trading Nene for JaVale McGee still is a big gamble. McGee’s maturity issues were on weekly display in Washington. He has loads of potential, but he probably also is going to want to be paid for it this summer when he becomes a restricted free agent. Denver now has four centers on its roster in McGee, Timofey Mozgov, Chris Andersen and Kosta Koufos. It will be interesting to see how the relationship between coach George Karl and McGee develops. The Warriors long have wanted an elite center and they landed one, even if he’s injured. Golden State picked up Andrew Bogut and forward Stephen Jackson for shooting guard Monta Ellis, forward Ekpe Udoh and center Kwame Brown’s expiring contract. Bogut’s latest injury is a fractured ankle that likely will keep him sidelined the rest of the season. Still, four doctors expect him to eventually make a strong recovery. Bogut was a third-team All-NBA selection just two years ago and is an impressive scorer, great passer and quality defender. While Ellis is one of the NBA’s top scorers, the Warriors were too small in the back-court with both he and Stephen Curry. With Ellis gone, promising rookie Klay Thompson will take on a bigger role. The Warriors also flipped Jackson – a potential headache – for Richard Jefferson and the San Antonio Spurs’ 2012 first-round pick. Jackson will be a better fit in San Antonio where he won a championship while the Warriors are hoping Jefferson can be rejuvenated in their up-tempo offense. The Timberwolves weren’t able to complete a trade to send Michael Beasley to the Lakers, which would have freed up more minutes for Derrick Williams. Nor Minnesota did pick up a guard to help compensate for the loss of injured rookie Ricky Rubio. The T’wolves had discussed acquiring Jamal Crawford if the Beasley trade expanded to include Portland. In short, the T’wolves didn’t do anything to improve their playoff chances this season – a disappointment considering their first-round draft pick belongs to the Hornets. The Wizards couldn’t get rid of Andray Blatche, but they did remedy two other headaches by dealing Young and McGee. Young likely would have departed in free agency anyway, and the Wizards probably would have had to overpay McGee to keep him. In Nene, the Wizards landed a quality center who is in the first season of a five-year, $65 million contract. The Wizards aren’t headed for the playoffs, but this was at least a step in the right direction. The Hornets gave Chris Kaman a leave of absence a month ago while openly shopping him, allowed him to return to enhance his trade value and then failed to move him. While there was some interest in Kaman, the Hornets will end up getting nothing for him after he becomes an unrestricted free agent this summer. The Hornets also unsuccessfully tried to trade forward Carl Landry, who also will hit the free-agent market this summer. The way it looks now, the Hornets will have traded their franchise point guard (Paul) for a player who’s leaving (Kaman), a guard who’s played only two games and also could leave in the summer (Eric Gordon), underachieving forward Al-Farouq Aminu and a 2012 first-round pick that might not end up in the lottery. Imagine how different it would be if NBA commissioner David Stern hadn’t vetoed a trade that would have given the Hornets guard Kevin Martin, forward Luis Scola, forward Lamar Odom and guard Goran Dragic.